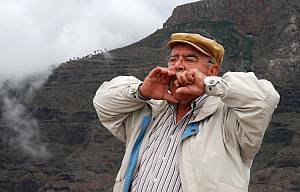 Originally used by the Canary Islands’ native people – Guanches – Silbo Gomero is a language that has been used in La Gomera for centuries and that is entirely made up of whistling sounds. It is seen as a social language and throughout the years has been used to communicate from long distances and even as a secret code language during the conquest and wars. It is believed that the first Guanches were from North Africa and brought the idea of a whistled language that later evolved into Silbo Gomero. However it is easy to understand the evolution of this language in La Gomera once we know its geography and landscape. Partly because of its past volcanic activity and man’s influence, the island’s landscape consists of hills, valleys and cliffs which made it hard for the inhabitants to go from one village to another. Silbo was used then by herders and farmers to communicate across these long distances. Of course, this means that communication can be ambiguous. That is why it requires a quick mind to be able to replace certain concepts with other ones that are similar in order to convey and understand the messages. Economic hardship in the 1950s forced many inhabitants from La Gomera to move and look for better opportunities. These events brought Silbo Gomero close to extinction like many other ancestral practices and traditions that represented ancient lifestyles. However the social agents of La Gomera and the Government of the Canary Islands have undertaken initiatives to protect and enhance the cultural value of this language. Since 2005 Silbo Gomero has been taught at schools in La Gomera in a bid to prevent its extinction and to ensure that the younger generations learn this language which in 2009 was declared Intangible Cultural Heritage of Humanity by the UNESCO.